Because literally. Literally okay. I’ve been itching to write this post. And I suppose you guys have been waiting for me to write this post too. Or not. I don’t know. I can’t read minds. But, yes. 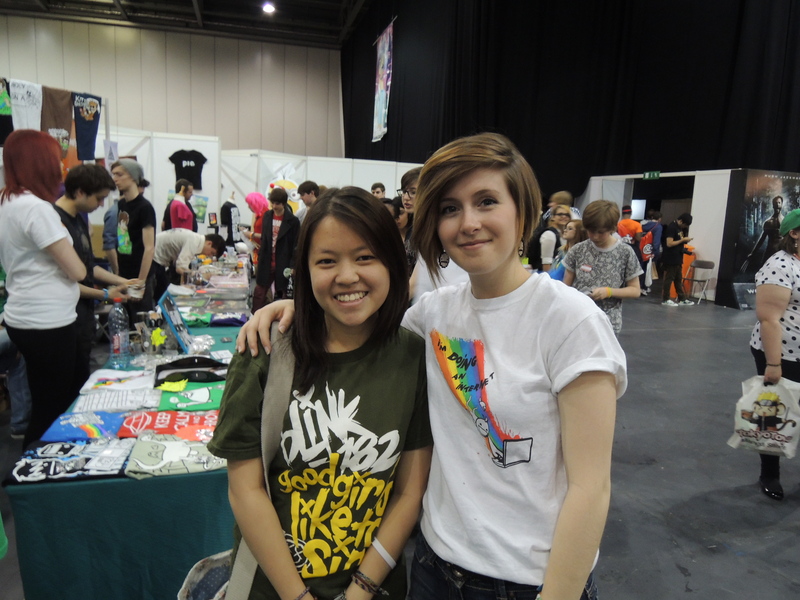 Let me just say how incredibly lucky I was that I was in London when MCM Comic Con/Vidfest UK was on. And it was a mere 10 minute drive from Kenzie’s place. Again, a unicorn moment. When I came to England, I hadn’t really expected to meet any youtubers. I mean, of course I hoped I did, but there was a higher possibility of that not happening. And when I couldn’t go to the BBC Radio 1 station in London to meet Dan and Phil the two weeks they were around before they were off to Comedy Week at LA and Radio 1’s Big Weekend at Derry, I thought all my hopes were dashed for good. Until the Friday before this day, when I saw Tomska and Dean Dobbs and several other youtubers tweeting about their presence at Vidfest. I wasn’t doing anything on that day so when I saw the tweets, my first instinct was to get up and change and walk there with the help of Google maps on my phone. But then it was raining and I hadn’t bought any tickets (you had to have tickets for Friday entrance because it was a preview day) and also I was staying at the Woolwich area aka the place an English soldier was recently killed at. 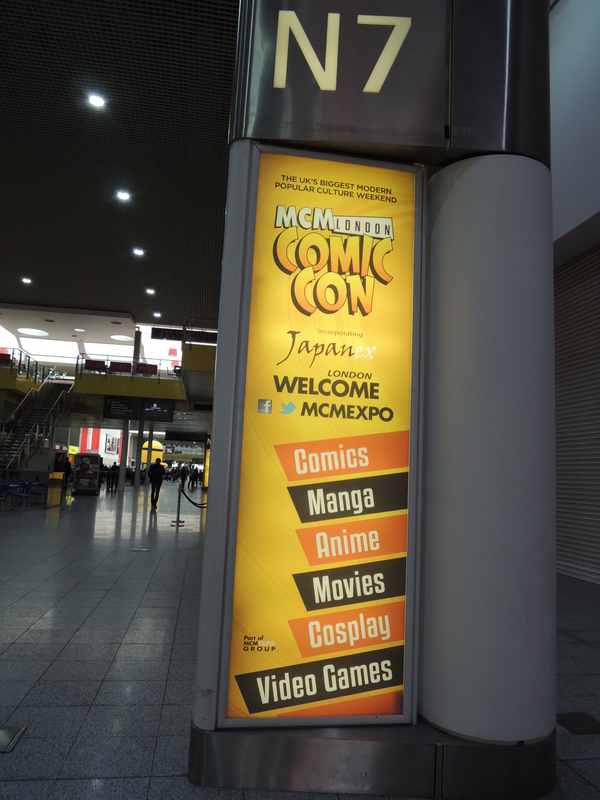 So I didn’t go out that day, and I was in central London the whole of Saturday, so at around 10.30AM in the morning on Sunday (the doors to Comic Con opened at 11AM), Kenzie drove me to London Excel at Royal Victoria Dock where Comic Con/Vidfest was. And let me tell you, the place was full of all kinds of cosplayers. Followers of my twitter would know what I’m talking about since I was tweeting the entire time I was queuing up for the tickets. And it was a long queue- like, really, really, really, REALLY long. 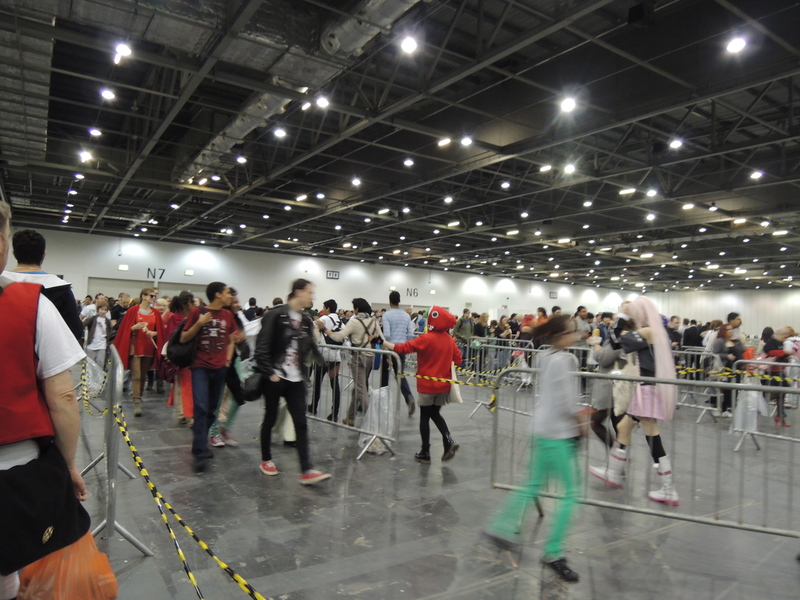 But it was a fun queue because I was exclaiming internally whenever I saw a particularly interesting cosplay. 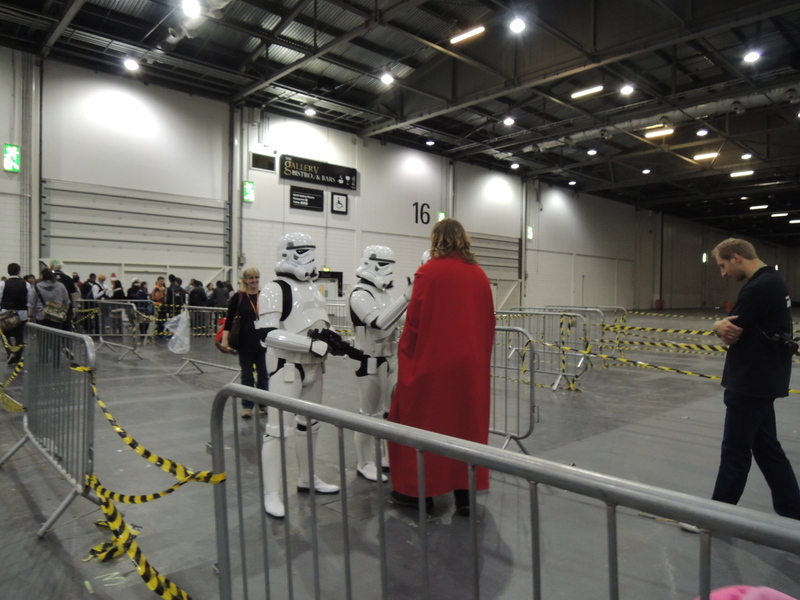 There were people dressed as Star Wars Imperial Stormtroopers, interrogating people (humorously) before they joined the queue and one of these people so happened to be a Thor cosplayer. It was hilarious. There were people cosplaying characters from Super Mario, Adventure Time, even Wreck-It Ralph (I was fangirling so hard) and Harry Potter and it was so cool and some were holding signs saying “FREE HUGS” and strangers were high fiving each other and god bless conventions like these. And then I was in and I was giddy with excitement and the first place I headed for was the Vidfest section at the far left of the convention. The first people I saw were Jack Howard and Dean Dobbs aka Jack and Dean JACK AND DEAN OH MY GOD WHAT IN REAL LIFE OH MY GOD and that was literally my reaction and I was so emotional oh my god just thinking about it 😦 I 😦 am so emoTIONAL 😦 and they were THERE IN THE FLESH like REAL PEOPLE like I CAN TOUCH THEM and after calming myself a little, I decided to explore the whole Vidfest section before joining the long queue of people lining up for Jack and Dean. So I went into a tented area where the cast of the Chronicles of Syntax webseries were having a talk and I expected Chris Kendall to be there but unfortunately he couldn’t turn up and that was one of the downlights (get it? Highlights? Downlights? Okay whatever) of the event but still, I’ll get what I can get. 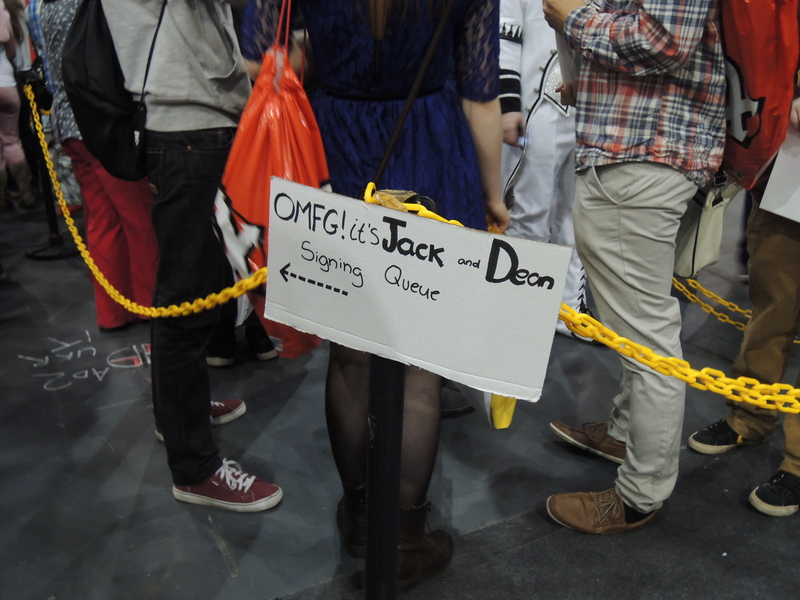 So after that I started lining up for Jack and Dean and I was so anxious and excited at the same time and just??? Didn’t know what to say??? What if I made a fool of myself??? 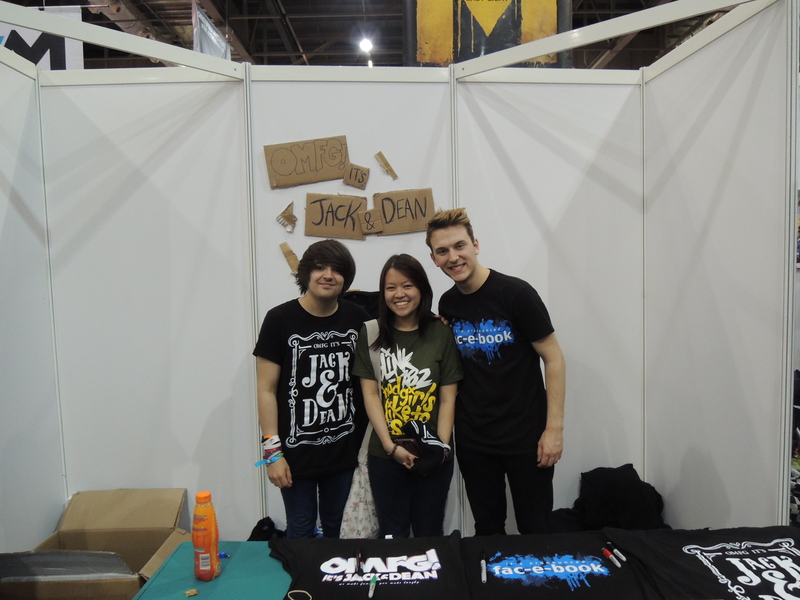 And then the guy in front of me started talking to me and three other girls who were behind me and we were practically fangirling over Jack and Dean and he asked if we were nerdfighters and I said “YES” really loudly and honestly, this was my favourite place to be. 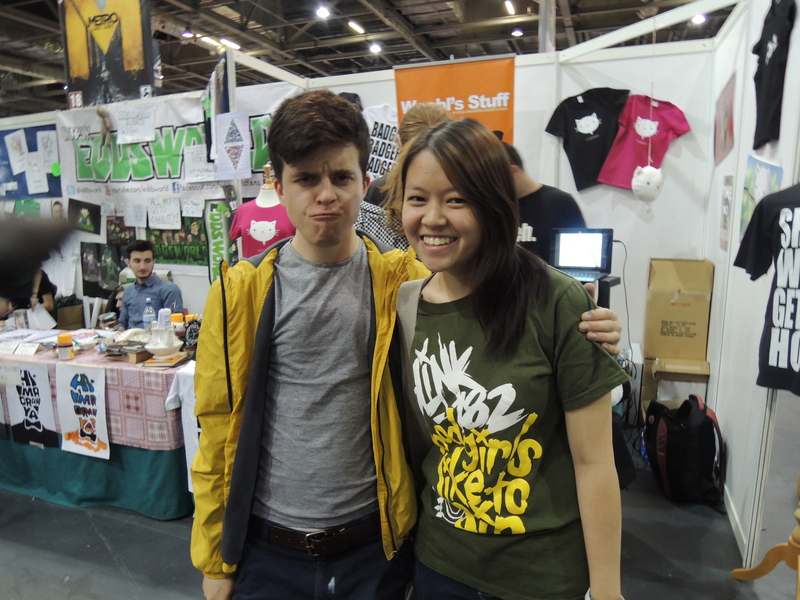 After that I decided to search for Alex Day’s Lifescouts booth. If you’ve been following my blog, you’ll know that I sometimes write posts about a certain Lifescouts project. I’d made an introduction post about it but in case anyone missed it, here it is. 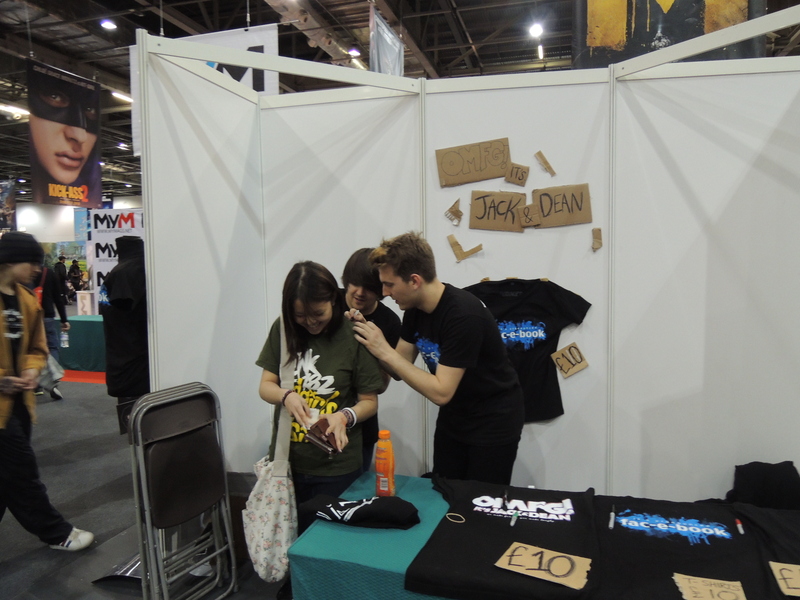 Basically, Alex was the one who created this project and he was selling Lifescouts badges at a booth at MCM. 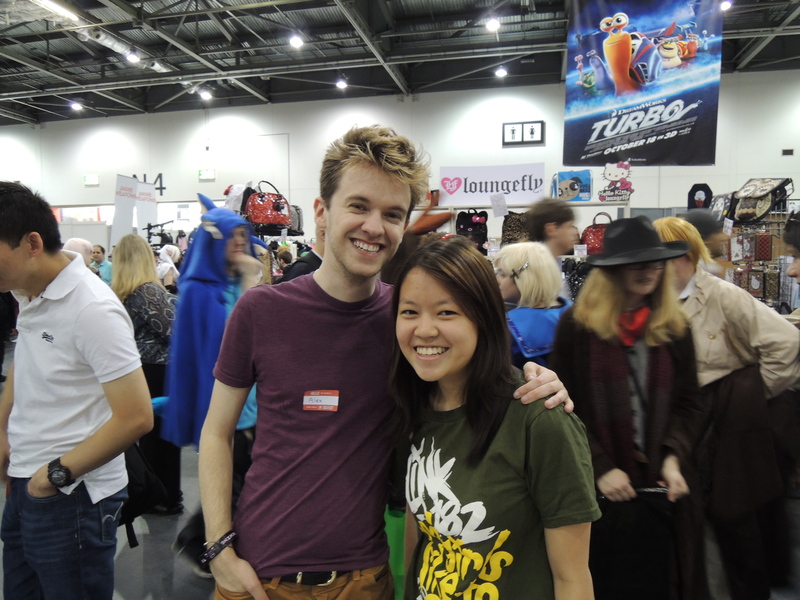 His booth was, ironically, nowhere near the Vidfest section so I had to search for it but MCM was such a HUGE place and I had no idea where it was and I couldn’t possibly ask any random person where “Alex Day’s booth” was because most people that were there weren’t exactly there for Vidfest only like me. So in the end, I resorted to good ol’ Twitter to see if Alex might have tweeted about his location and- he did! He tweeted that his booth was under a huge Wolverine poster and in the end I found it and Alex was just sitting there and I went up and said, “I finally found you!”, holding up my phone to show him his tweet and he laughed his ALEX DAY LAUGH and lord help me. In my nervous frenzy, I asked him, “What’s the difference between the 3 pound badge and the 5 pound badge” without looking at the words on the signs put up at his booth that clearly said the corkboard was 5 pounds and the badges were 3 pounds. So when Alex explained it to me I wanted to slap myself oh my GOD Michelle you are so intelligent A+ for making a fool out of yourself. 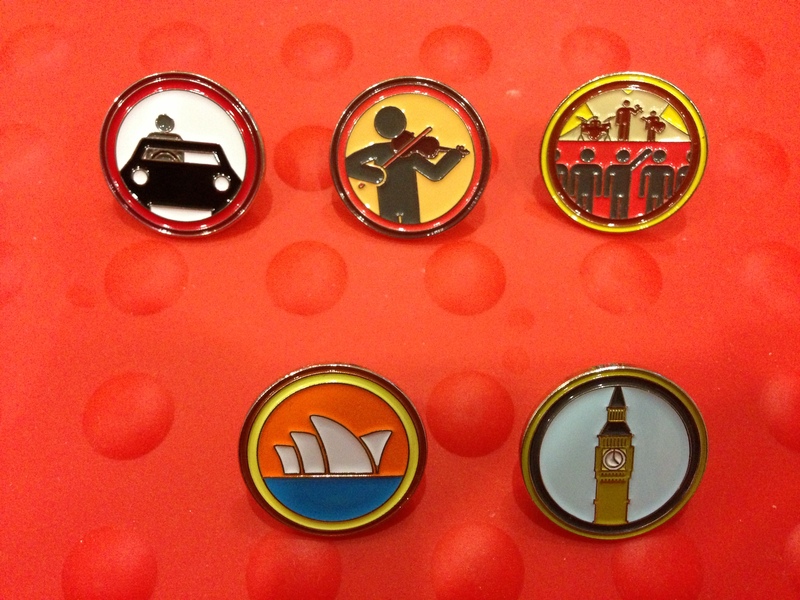 So I said, “I’ll have the Big Ben badge” and when Alex gave it to me I said “this is my first time in England” and he said “oh did you have a good time here?” and I said “yeah I did I’m flying home tonight” and he said “oh have a safe flight home!” and then I asked him for a photo and he said sure and came out of his booth just to take a photo with me and also signed my shirt (Alex: “Sorry but this might tickle a little” [sobs into hands]) and after that people started to notice him so he was busy taking photos for a while but not after he said “it was nice to see you!” but despite that I still lurked around his booth because I wanted to have an intelligent conversation with him (cough) but as he was busy I avoided looking creepy by buying another four badges. Haha. Hahahahahaha. After deciding that continuing to lurk at Alex’s booth might get me kicked out of the convention itself, I returned to the Vidfest section. 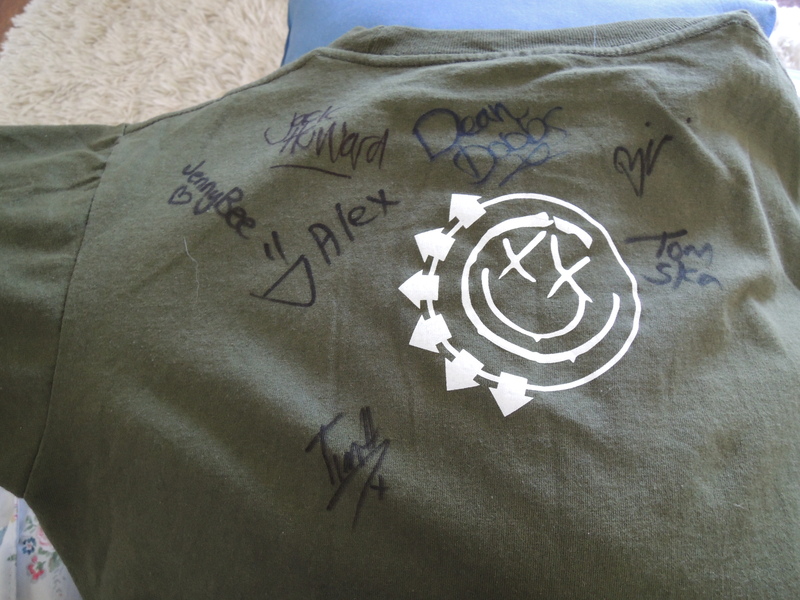 The line to meet Tomska was still pretty long so I decided to leave that for last- and went to find Bing first. To my dismay, Bing looked like he was getting ready to leave his Hi, I’ma Draw Ya booth but I was determined to corner him even if I have to. I was going to be leaving in about an hour and I wasn’t going to leave without a photo with Bing, that’s for sure. So as he came out of his booth, I went up to him and asked if I could have a photo and he said, “Yes sure but I’ve got to take a photo with these guys first” and I was like “of course no problem” so I waited because there were quite a bunch of people waiting for him just like me and when it was my turn, I got him to sign my shirt and we took a photo together! Let it be known that he was bending his knees to match my height I just THAT MAN and the person who was helping me to take the photo started laughing so I suspected Bing must be doing a funny face and I was right. I said my thanks and he left for his lunch break. Unfortunately, that meant I couldn’t get him to sign any merch I might buy off him but that was alright. 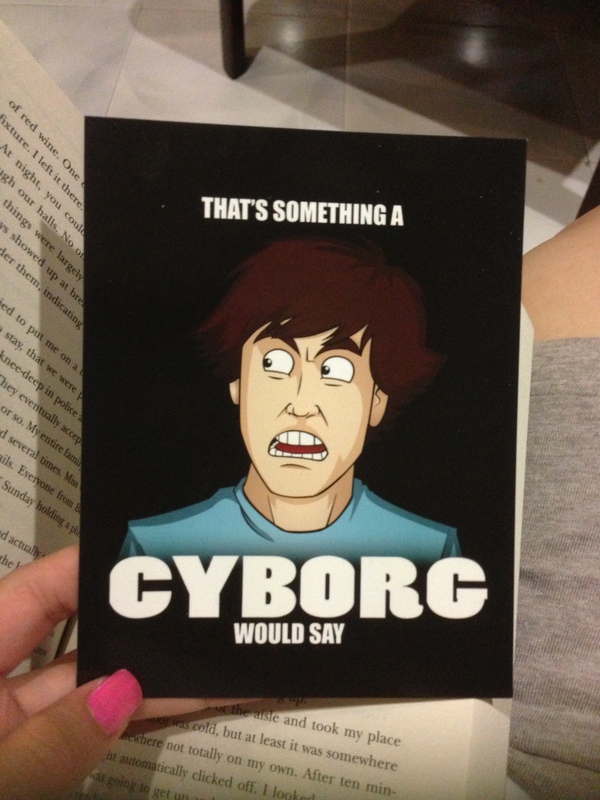 In the end, I just bought a postcard of his When Cyborgs Attack video aka my favourite video of his. 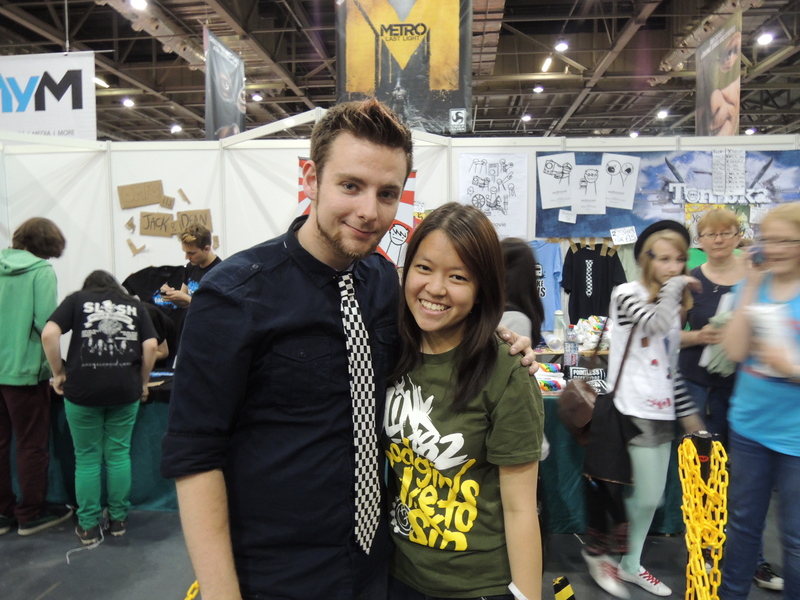 Since I’ve already gotten my Tomska merch (a shirt) (the same one Jenny was wearing in the photo she took with me) I started to line up to meet him in person. At one point in the queue, the people in front of me started to recite lines from his asdfmovies and when I was second in line to meet Tom, someone in the queue shouted, “EVERYBODY DO THE FLOP!” but of course no one fell facedown like in the asdfmovie 6 video otherwise there would be quite a commotion. It was then that I told myself that this was where I was meant to be all along, where people recite lines from their favourite videos and right then I wished I’d come with someone who was as passionate about youtubers as I was. But again, I’ll get what I can get. Tom has been portrayed in a very negative light on the Internet, especially in Becoming Youtube videos but in real life he’s so much more than what he puts on the Internet for people to cruelly dissect and tear down. I was next in line but someone came up to him with a phone asking, “can you talk to my brother on the phone please?” and Tom said to me, “Hang on one moment, okay?” and I nodded and when he spoke into the phone he greeted, “HELLO BROTHER” and he’s so nice to fulfill that little request which might’ve meant so much to the person on the receiving end. Brother. And then it was my turn and when he saw me he said “HI!” and I just went forward to hug him saying “can I please have a hug?” and he said, “Of course you can!” and he enveloped me in one of those bear hugs which were tight and firm, the kind of hugs that make you not want to let go forever. And then he released me from the hug and asked “how are you?” and I said I was good and that I was from Malaysia and that I would be flying home today (the only conversation starter I could come up with) and he said “wow, that’s far, have a safe journey home!” and then we took a photo together and he signed both my blink shirt and his merch shirt that I bought and when he did he said, “I’ve got chalk all over my hands from signing shirts” and then I said “it was good to see you!” and then I left and I was so full of emotions by then I just wanted to jump around and scream with joy. I was pretty much already done for the day and contemplated calling Kenzie to pick me up since it was already 1.30PM and he said we had to leave East London by 2PM the very latest. 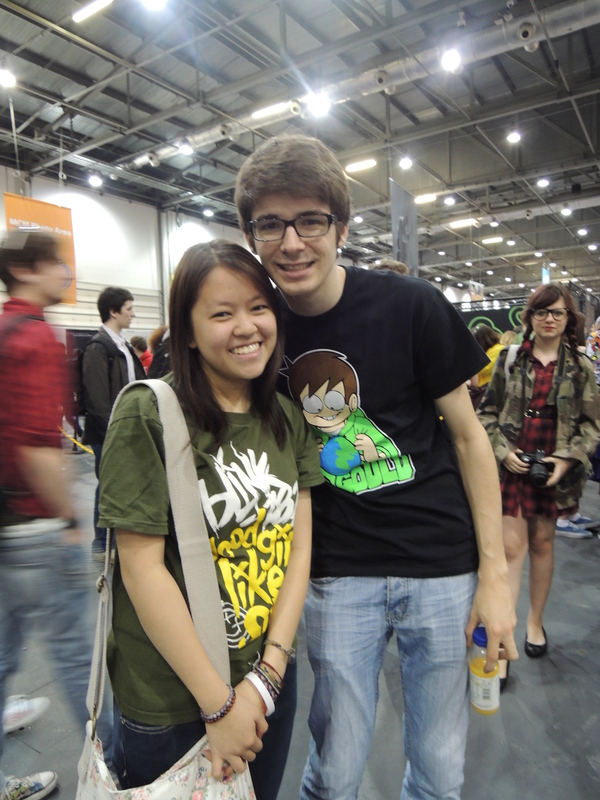 But then I saw Tim and he was the remaining youtuber at Vidfest that I knew and liked. 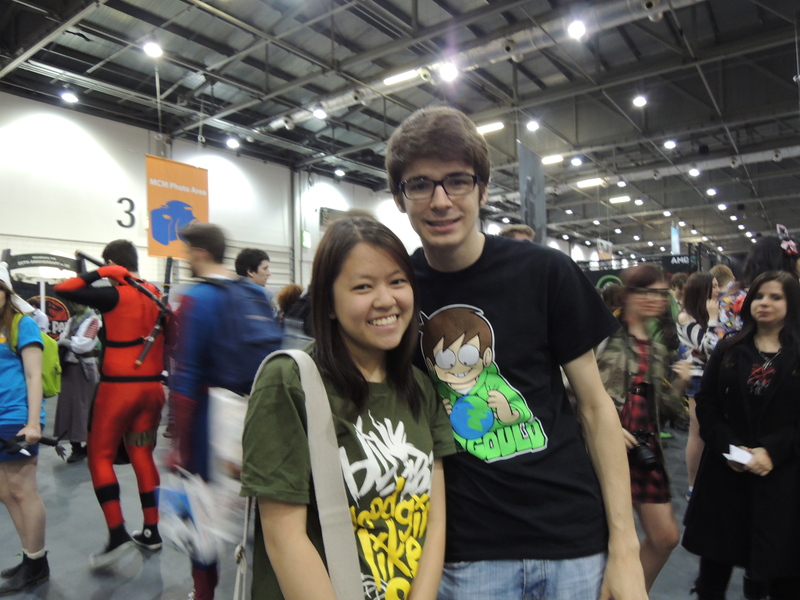 Like Jenny, he was manning Eddsworld’s booth where a small line was starting to form to purchase Tomska merch and I joined it but little did Tim know that I was only joining the line to meet him and not buy any more merch so when I got to the front I said hi (the trick to catch one’s attention quickly is to say HI in a really enthusiastic way; I mean, it’s worked for me) and asked if I could get a photo and like Alex, he said sure and came out of the booth to do so, carrying a bottle of orange juice in his hand (???). Tim??? What??? After the photos and him signing my shirt I told him I loved his new video which, coincidentally, I’d just watched the previous night and he said, “Thanks, it really means a lot to me” and before leaving I said, “See you later!” and then realised that I’d made a mistake and wouldn’t really be seeing him later so I paused and said, “Or see you again. Sometime. Soon. I hope.” and Tim said, “Yeah, see you later, I’ll be here till 3.” But I didn’t have the heart to tell him I was leaving soon because thinking about leaving was making me sad so I didn’t say anything. So obviously I had no chance of meeting him but ’twas okay. 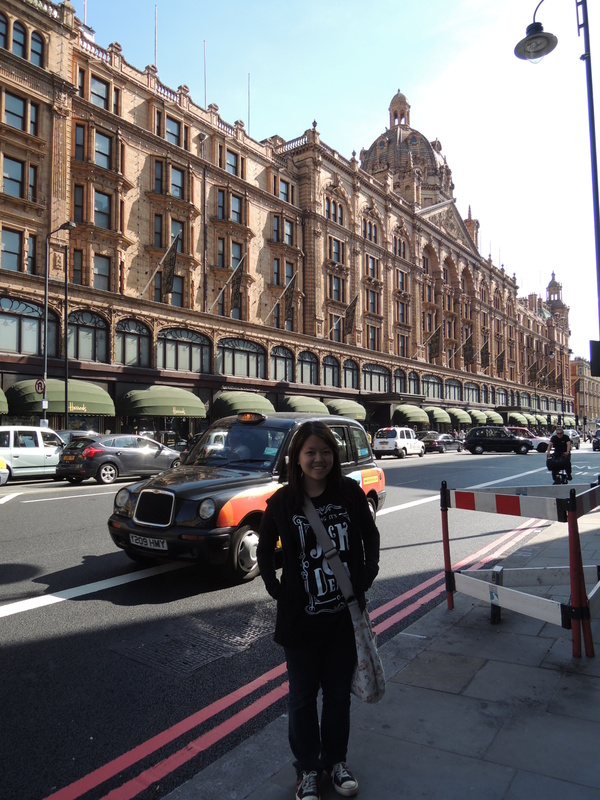 I comforted myself with the thought that this wasn’t my last trip to England. It was just the first of many to come. At around 6PM, Kenzie drove us to Heathrow Airport and thus, this post comes to an end, as my England trip has officially done the same. I’d been having England goggles the whole day, but my emotions from Vidfest managed to cover them up. Pair the goggles with post-Vidfest depression and you get a very emotional Michelle on the plane. Still, I reminded myself this wasn’t the end, not exactly. There’s also one cheesy saying that goes, don’t be sad because it ended, be thankful because it happened, and yeah that’s basically it. There’s also a line from the Warm Bodies movie that goes, every great thing starts out a little scary. So, so accurate. I never mentioned it, but I was actually pretty reluctant to go to England initially. 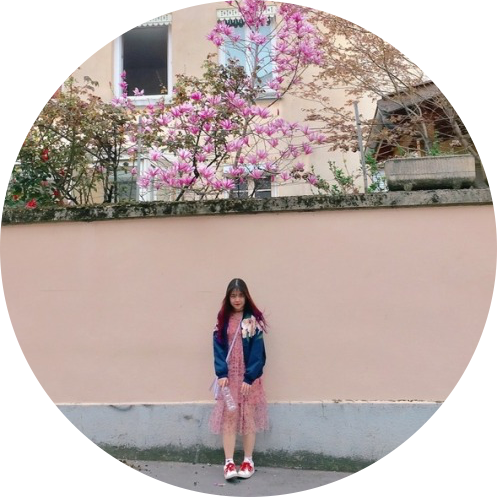 I was afraid of leaving home for a month, of being alone, of airplanes, of being in a foreign country, of many, many things, but my pride forced me to ignore my fear. And for the first few weeks, I was quite homesick. But towards the end, I realised I’ve changed as a person. And perhaps it wasn’t a huge change, or to some people it might not even be a change at all, but I know myself, and I know I have, and I know it’s a good change. And I’m thankful for that. Aunty Sue also told me that I’d come to England and stayed here not only as a tourist, but I’ve also lived the English life like an English, technically, while staying with them, and that’s better than living a tourist life in a foreign country, and I agree with her. Learning to adapt has also been one of the tougher challenges here, surprise surprise. Because while I might be a strong advocate for all things British back at home, I still got a cultural shock when I was here. But everyone adapts eventually. It’s human nature to do so. I might not have been as adventurous as I’d like in my time here, but I’ll gradually foster the seed that’s been implanted in me due to this solo trip. So hyperbolic, man. But also true. So, kids, here’s a life lesson for you from me: if you ever feel afraid of doing something huge, do it anyway, because chances are you’ll learn to enjoy yourself and love it at the same time, and it’s worth the initial fear and anxiety. Getting out of your comfort zone once in a while is a good exercise. Note: This post is late, as usual, but I finally finished my England chronicles! Don’t know whether to be happy or sad, but there’s another post I have in mind about post-England trip Malaysian life so stay tuned for that, although that won’t be a Michelle Takes England post anymore. That project’s finished and shall be archived forever.